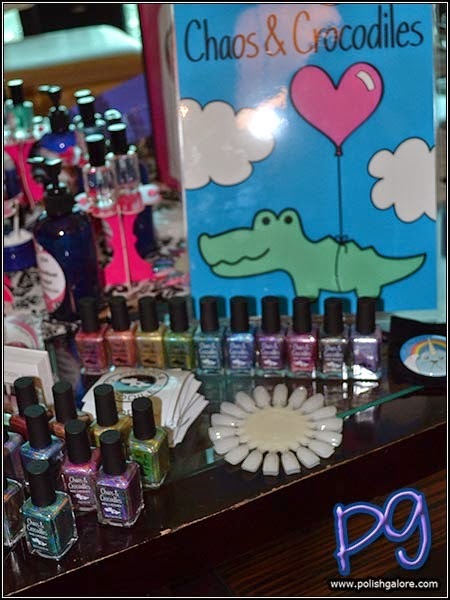 During Cosmoprof North America, indie brands KBShimmer and Girly Bits organized an after hours events for indie brands and media to come together AND IT WAS AMAZING. Representatives from NAILPRO Magazine, Nail It! 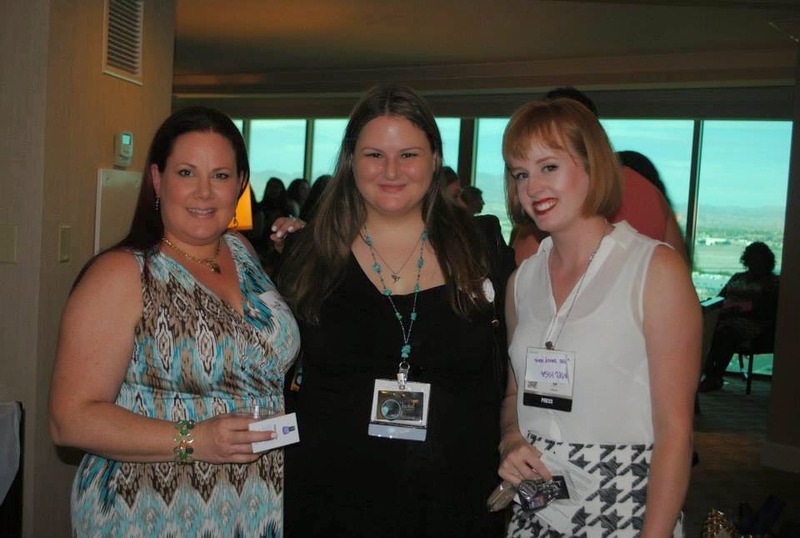 Magazine and Nails Magazine were in attendance along with various bloggers from around the United States. There was so much to see and I hope I got most of it photographed accurately. This event was truly amazing. My first year at Cosmoprof, indies were pretty much unheard of. My second year, we had a very impromptu dinner at the Tropicana where a few indies handed out some polishes. Last year there were two dinners (one at Tropicana again which I attended) where indies were able to hand out polishes but this?! 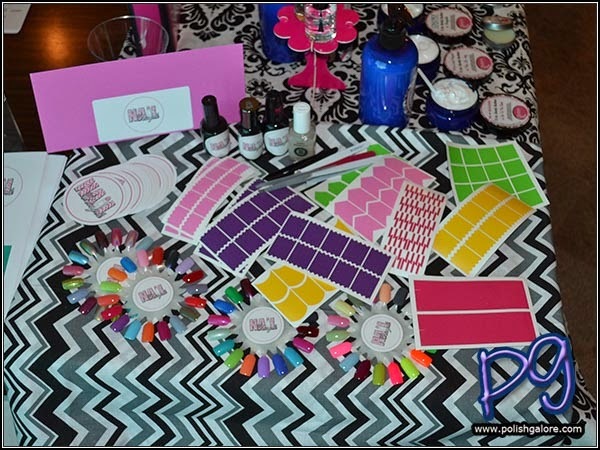 This was a great concentrated area that was meticulously set up by KBShimmer and Girly Bits with displays and the most amazing gift bags but all that will be coming soon. 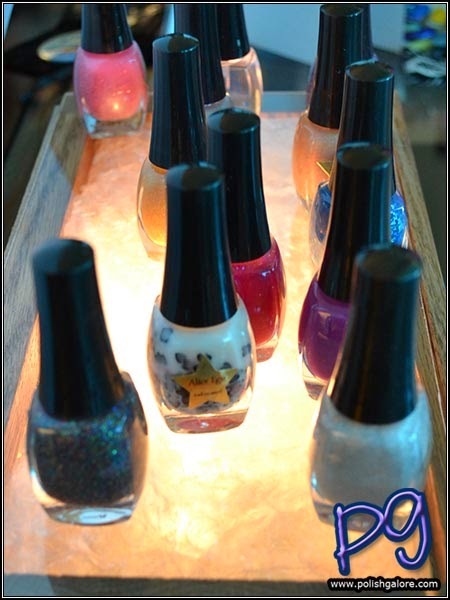 Girly Bits had a nice display of their polishes and rings of nail swatches for our viewing pleasure. Additionally, we received a bottle of her new What Happens In Vegas... Ends Up On Instagram polish. This will become a limited run polish on her website, so stay tuned for that. This was also the 2nd in her series - last year was "What Happens in Vegas... Ends Up On Facebook" which I have a mini bottle of in my stash. 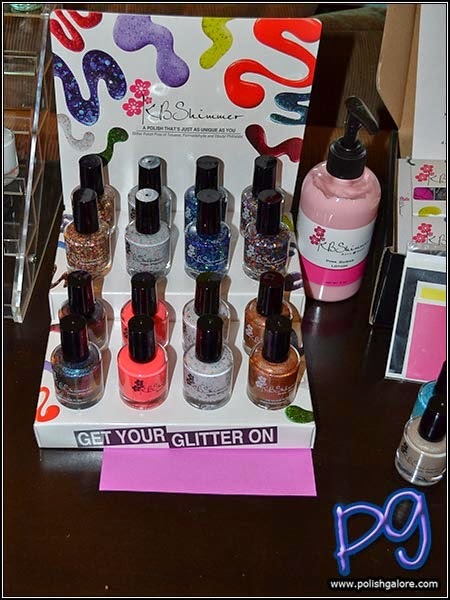 KBShimmer also had a sweet set up including her new nail vinyls! I received some sheets from her that I'm excited to use - I hadn't tried nail vinyls yet so this is fun. She also had the nicest media kit I've received to date that included a branded USB with product information, press releases and high res photos; the Beach Themed 6th Anniversary Trio, nail vinyls, SOMETHING EMBARGOED THAT I'M NOT GOING TO TALK ABOUT, a bottle of her Clearly On Top quick dry top coat AND a 2 oz refill bottle (! ), a 2 oz pink sugar scrub and the coolest 4 oz bottle of pink sugar moisturizing nail polish remover. Perfect items for Vegas but also just for a great starter kit into KBShimmer. I seriously hope she offers those kits on her website some day soon because they would be a fantastic gift for friends and family. I also got to see some photos of her warehouse and her wall of glitter containers which literally made me squeal like a 12 year old girl. It was fantastic looking. This husband and wife team are extremely sweet and have really helped change my mind on indies in general. They are doing everything right. Serum No 5 has GROWN since the last time I saw her polishes! Last year I received a bottle of Day Glow but then I misplaced it and it slipped my mind. This year, she had so many polishes that I literally did a jaw drop and double take! In addition to polishes, she is also coming out with nail vinyls. Victoria is so sweet as well - she hugged me and asked for a photo (which I was such a fan girl all night). She gave us this cute cube that included Flashing Lights, Another Year, Let's Cheer which just launched last week, another of her polishes, a cuticle serum pen and a sugar scrub cube (to be released later this year). 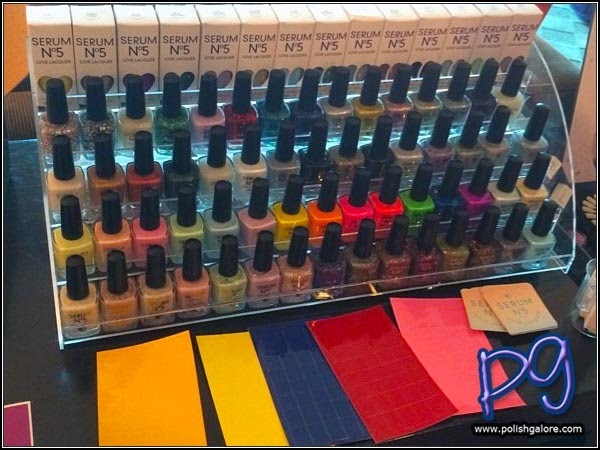 I grabbed a photo of Alter Ego Nail Enamel before she had finished setting up her display - oops! Cynthia is a sweetheart and young at heart even though she has been doing her nails longer than I've been alive. She included two of her shades including best selling Penny Pincher in my bag. 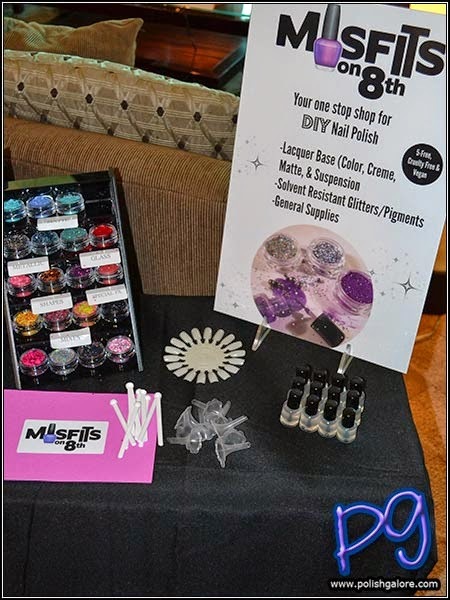 Misfits on 8th is a supplier for those who want to start making their own polish. She included a starter kit for us to create our own colors, as well some extra glitter, her top coat, and 2 of her mini polishes to try. If you're looking into starting your own line, check her shop out! 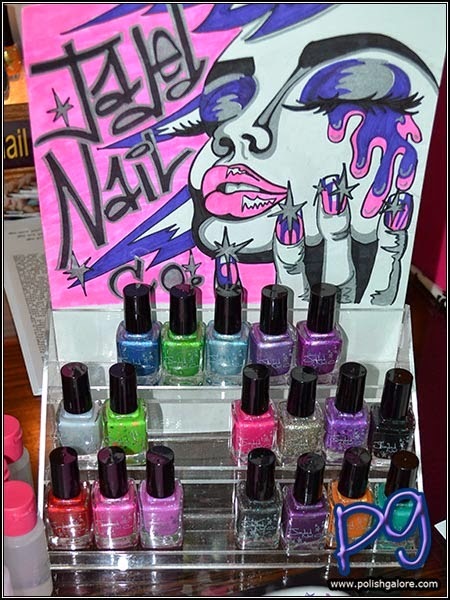 Jaded Nail Co was also there with her line of unique polishes. I got to speak to her a bit the day prior and she's a blast. Polish TBH is a girl after my own heart. Her polish line started out of an obsession for Britney Spears Fantasy line of perfumes and we all know that I'm a Britney fan forever. She included a few colors including a neat color changing glitter polish. 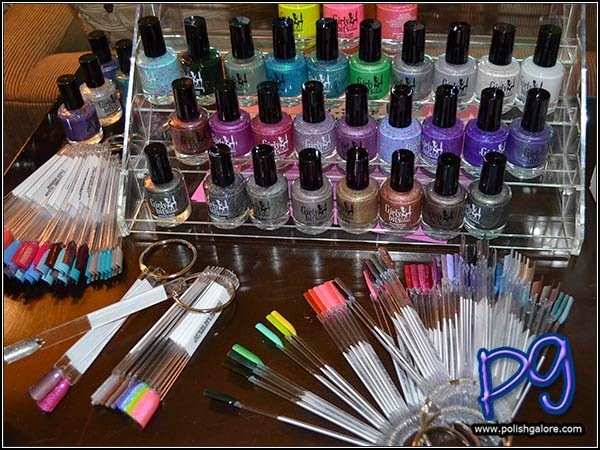 Linda from Nail Vinyls had a great station set up for us to play with. Her tagline is simple but perfect - Place. Polish. Peel. I had received a sample with my Cult Nails order earlier this year but hadn't used them yet but now I have LOTS to play with and that makes me happy. I'm going to step up my nail art game! Nail Vinyls are now available in a variety of shapes and have made its way into over 10,000 homes so far. She's also moved into decals for your every day life including ENOUGH HOLOGRAPHIC VINYL TO COVER A HELMER. Hello sparkles. 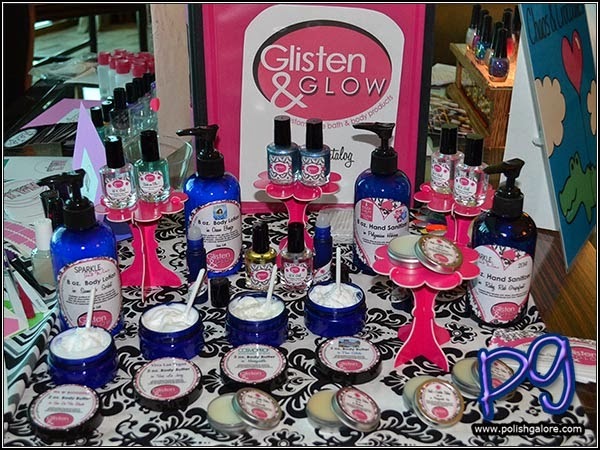 I knew Glisten & Glow made balms and top coat but did you know they also have creams, lotions, hand sanitizer and NOW POLISH?! She had goodies for us to play with and just for you! Take 10% off your order from now until 1 September 2014 using the code Cosmoprof14. I literally squealed (again) when I saw Chaos & Crocodiles. 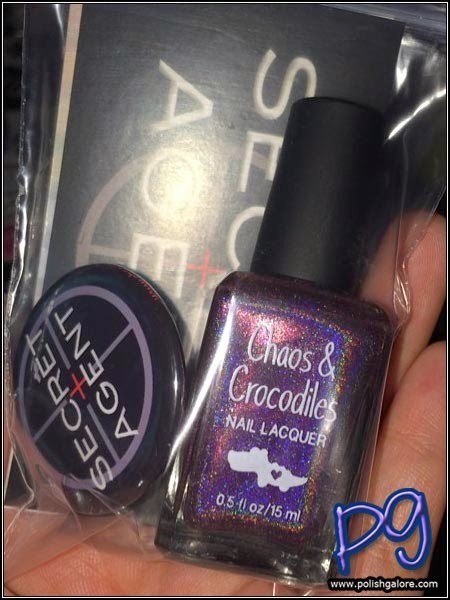 I had preordered the entire "Secret Agent" collection (the 10 out of focus polishes in the back) last month on a whim and turns out it was the best decision ever. Then, like a real secret agent would, owner Sarey slipped me a bottle of Operation Vegas. IT'S PURPLE. IT'S HOLOGRAPHIC. SHE KNOWS ME. SHE GETS ME. Ahem. I feel really bad that we didn't get to hang out more - we had made semi-plans and then it just fell apart on me. Blah. But she is so sweet and her polish is SO awesome. 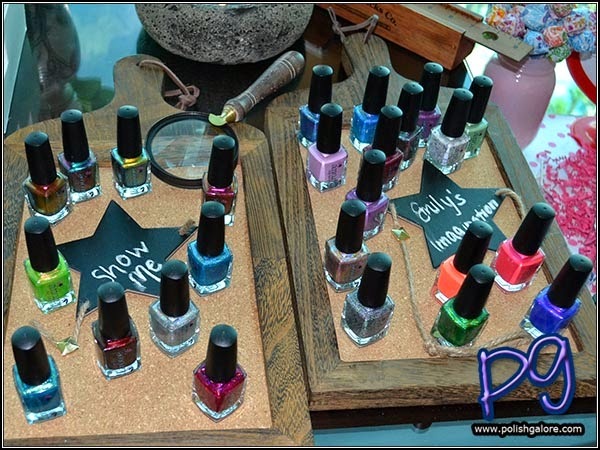 Elevation Polish had this cute set up on the end table and I was taking photos when she put up a sign that said "Take One." Due to the sun setting, I decided to use my iPhone light to check out the polishes when I found out that she has some amazing holos in her collection! I snuck up and asked her how many could I "REALLY" take because I fell in love and she held up some fingers and I ran away like a little kid. And now I have some awesome polishes to wear for you later to come. 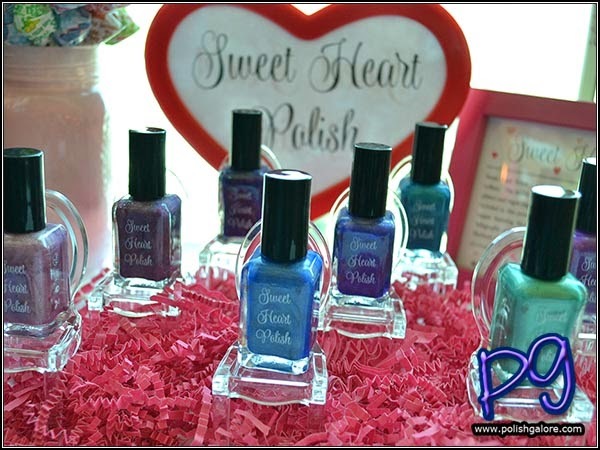 Sweet Heart Polish had the most adorable thrones for her polish set up! I hadn't tried her polish before but she included a couple of bottles inside a cute packaged box with cut out window that made me smile. Llarowe started as an e-tailer in the United States that offered amazing indie brands and international brands that were hard for us to obtain otherwise. Now she has her own line - Colors by Llarowe that has over 60 colors! She debuted her Show Me and Emily's Imagination collections and gave us several shades to try. Even more amazing, she will be opening a brick and mortar store in Colorado later this year and will be offering things like "Polish Making Parties!" Now, Leah Ann had recently announced a new logo change which was not well received. I asked her what her final decision was and she surprised me with her answer. "We are keeping our original logo for now and will be going back to the drawing board for a new logo. If my customers don't like it, I'm not going to do it." That was awesome to hear - a company actually listening to her customers. I look forward to the new design to come. Glitter Daze is another company that has grown quite a bit! A fellow Texan, she has all new packaging now and a new website! Apparently there was a Cosmoprof exclusive polish given out but somehow I missed it and I'm kicking myself for it. She has also gotten rid of her mini bottles, which I had reviewed previously. 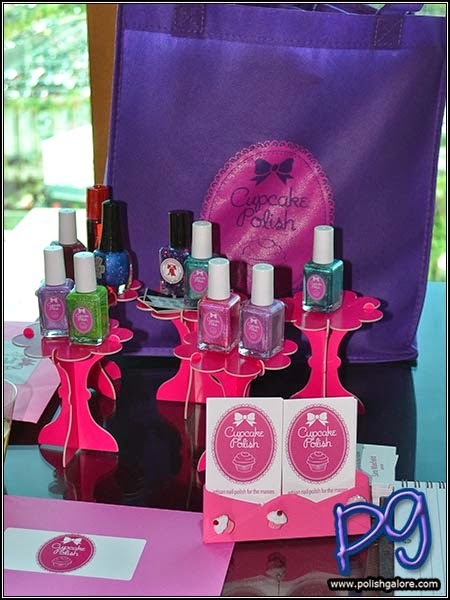 Cupcake Polish was another new-to-me company with a sweet showing. Sadly, the USPS didn't deliver her boxes in time for the event so all she had was what she carried on the plane with her but it was still a sweet showing! We also received information and samples from Emerald & Ash (who now has my favorite polish name ever - see Instagram AND probably the best bottle of cuticle oil I own - photos to come); Model City Polish whom I've been wanting to try and now get to; Pahlish's own Cosmoprof exclusive and I THINK that is all! Again, tremendous thanks to all the indies that made this event possible. I wish every single one of you the best of luck and I'm so honored to have been apart of this event! Wow that looked like a lot of fun! 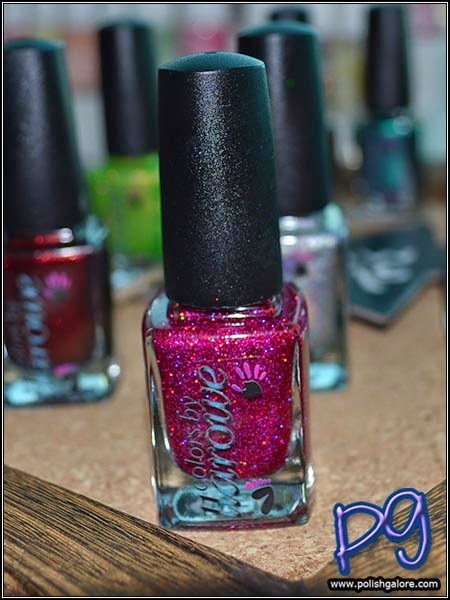 So many companies that I a huge fan of including Elevation Polish :) I'm not sure if you had a questionable opinion of indies before, since you said KBShimmer changed your mind about them, but so many of thee companies have been brilliant right from the start! 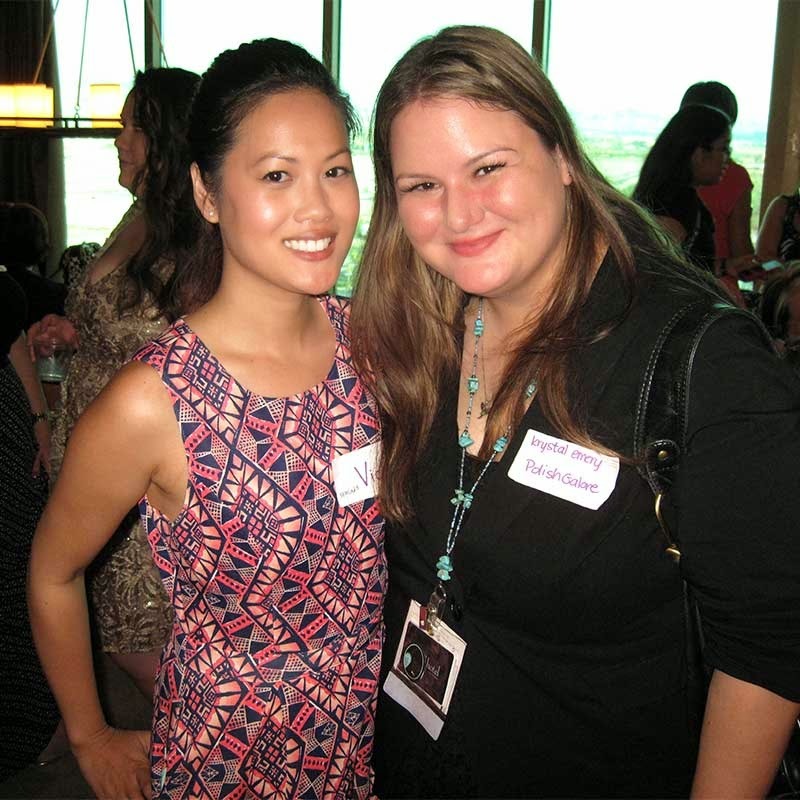 I hope one day I'll be able to go to Cosmoprof too :) Thank you so much for sharing! It really was. Regarding indies, I had some major issues with some companies in the beginning - sticky bases, melting glitters, or polishes that did not look anything like what was being sold on their website. It was only a few select companies, but I had shied away from trying others. Now there are some indies I buy a lot of - Digital Nails, ellagee, I Love Nail Polish... and others that I have more than I realize of - JENsations (now out of business), KBShimmer (I had purchased her entire summer collection in 2013) and Girly Bits (I bought the Gloss48 exclusives) and Cult Nails (I have her entire collection). 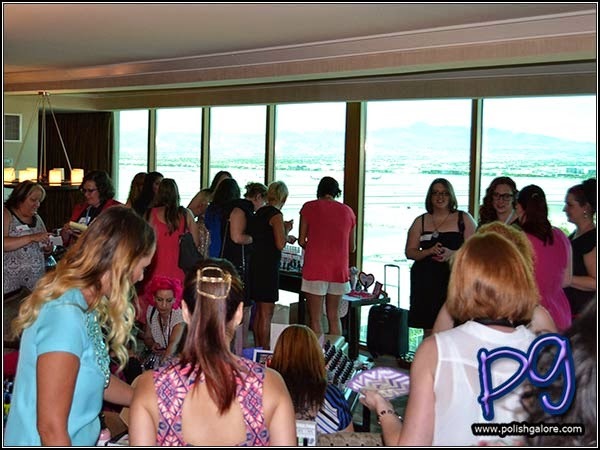 This event was separate from Cosmoprof but was held during the same time period - I can't guarantee that they would hold another one but given the success of this event, I'd hope they'd do it again! Thanks so much for your awesome coverage of Cosmoprof! I look forward to it every year and love the inside glimpses you give us.